Wednesday, 5.45 am and I hit the road. It’s not yet busy-busy but far from empty as people start their commute earlier and earlier to avoid the rush hour (or should that be the slow hour?) I make good time, arriving at Beachlands, Hayling Island just after 6.30. I pay my pitch money – £8 for my size vehicle – and another guy indicates which line of vehicles to join. Oh good, I’m on hard standing! 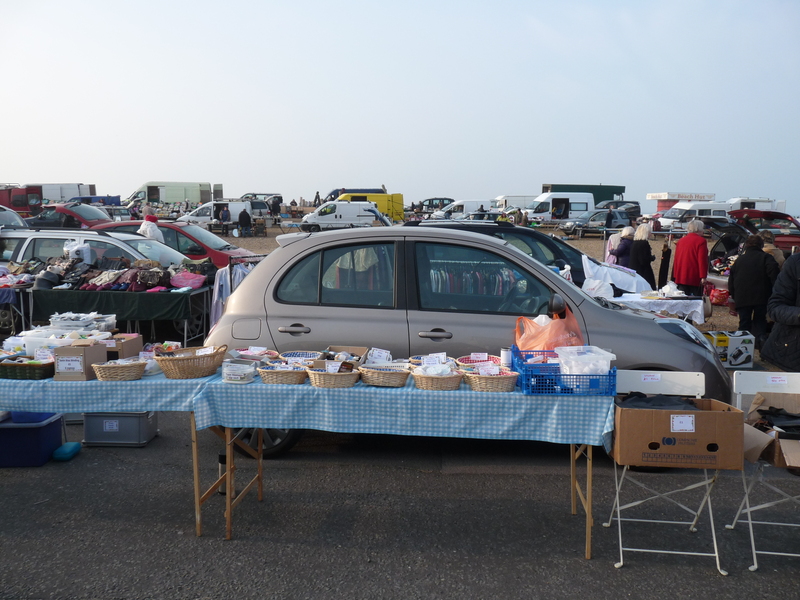 (The car boot stretches out onto the beach and there the sand gets everywhere. Plus the nearer you are to the sea, the colder it tends to be.) He signals that I need to pull forward. “There’s more room in my bed than we get here,” I hear one woman complain. Certainly there’s not a lot of room between rows: some people with especially wide or posh vehicles guard against the paintwork being scratched by covering the passenger side of the car with a blanket or duvet. I return to my pitch and set out my stall. Despite the early hour, there are customers already. But the car boot really gets going once the first bus arrives. I see many of my regulars, including a couple of ladies who also go to Ford. One of my online customers arrives to collect her order. During the summer – when there are even more stallholders – a changing influx of holidaymakers adds to the throng. The sun gets stronger and off comes the bodywarmer and eventually the jacket. But I’m still thankful for the thick tights beneath my jeans. This is the south of England, not the south of France! The crowds thin at around midday. I take my lead about when to start packing from the stallholders behind me in the line since it’s difficult to get out before they do. 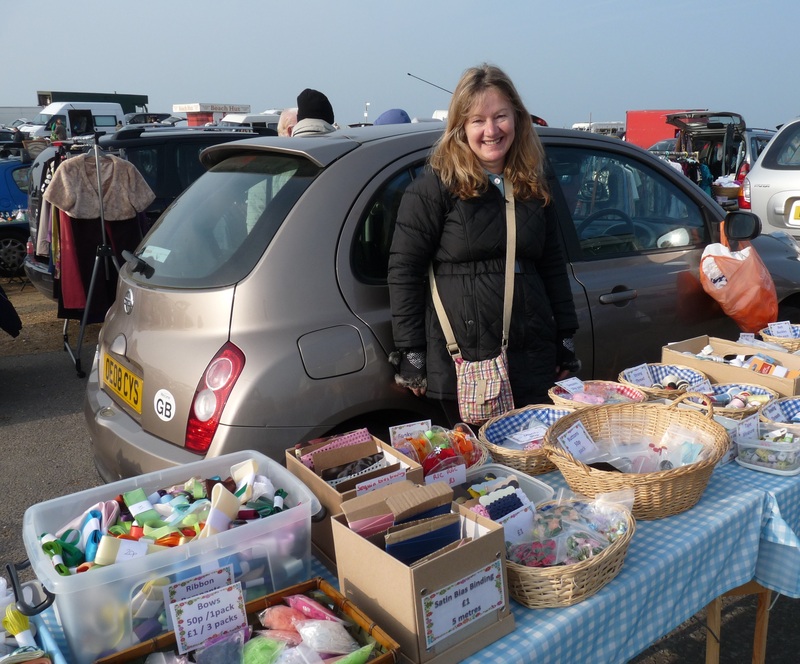 I lock the car and make for the fruit and veg stall – it’s good quality and much cheaper than the supermarket. On the way home, I fill up at one of the petrol stations on the island which tend to be 3-5p cheaper than most others on the A27. Sometimes I make a day of it and go to nearby Gunwharf Quays but today I go straight home where I arrive at 1.30. Postcode for the satnav is PO11 0AG. If travelling East to West on the A27, look out for the Emsworth exit and take the next exit which is soon after for Hayling Island and Havant. Follow the signs to Hayling Island, take the right fork for Manor Road and follow the signs to Beachlands. If selling, go straight on at the mini roundabout. If buying, park at the adjacent car park. 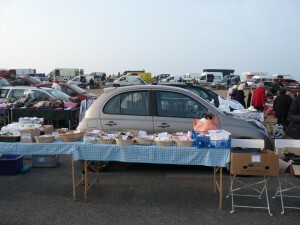 The car boot is held on Wednesday mornings throughout the year. Hi Christine its Patsy from Hayling. It was lovely chatting yesterday and I have already been out looking for the sewing pattern you shared with me, unfortunately looks like I will have to order it online. Have not looked at bloggs before so this too is a new experience for me. Yours certainly is very informative and info about bootys is really useful especially as I have only ever visited Hayling! Keen to start my first simple project (bunting and cushion covers). Will let you know how they turn out and hopefully see you on Hayling in the near future. And thanks for your help and advice.